Lowrance, a world-leading brand in fishing electronics since 1957 and longest running sponsor of Bass Anglers Sportsman Society (B.A.S.S. 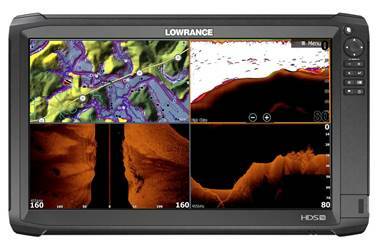 ), today at the 2017 GEICO® Bassmaster Classic, announced the production of the HDS CarbonTM 16, a new high-performance fishfinder/chartplotter with a 16-inch screen – the largest ever produced by Lowrance. The massive 16-inch high-definition screen on HDS Carbon 16 displays provides an even bigger stage to showcase the clarity, high resolution and superior target separation of SolarMAX™ HD technology, exclusive to the HDS Carbon series. Setting up a four-panel split on the HDS Carbon 16 gives anglers the equivalent of four seven-inch screens on a single display. Triton® Boats has already completed new production bass boat designs accommodating a factory flush-mount installation of the HDS Carbon 16 at the console and at the bow. Anglers in the market for a do-it-all, integrated system need a processor that can smoothly drive high-tech features like StructureScan® 3D with SideScan and DownScan Imaging™, StructureMap™, Broadband Radar™ and SiriusXM® Weather Chart Overlay. HDS Carbon 16 delivers on that front, taking processing power to the next level with a dual-core processor that allows anglers to switch between applications and simultaneously view independent sonar feeds with ease. Lowrance SolarMAX HD display technology features high-definition views and clear visibility in all conditions with the widest available range of viewing angles – even when wearing polarized sunglasses. The new displays feature 1920x1080 HD resolution and are engineered to withstand higher temperatures than conventional units, offering enhanced reliability in warmer climates. The secret behind the new SolarMAX HD displays come from the implementation of the most advanced IPS (in-plane switching) screens in fishing electronics. With superior color accuracy and boosted high-definition reproduction, IPS screens are perfectly designed for viewing picture-like sonar images. Whether viewing menu panels or onscreen fish targets, the improved clarity and sharpness of SolarMAX HD displays are clearly evident from any viewing angle. With Live Network Sonar, HDS Carbon 16 gives anglers the capability to view and control two independent, live sonar sources at different locations — like the front and the back of the boat — from a single display. This powerful feature provides anglers with a comprehensive picture of underwater activity with convenient and complete control. In addition to integrated wireless connectivity, HDS Carbon 16 features Bluetooth® control of multiple Power-Pole® shallow water anchors and Bluetooth audio streaming from the SonicHub®2 marine entertainment system. Anglers can navigate with ease behind proven Lowrance navigation technology, high-resolution mapping with enhanced coverage of coastal and inland waters, a 10 Hz internal GPS antenna, and a multitude of mapping options accessible from the unit’s dual microSD card slots. HDS Carbon 16 is compatible with the most expansive selection of optional cartography on the market, including Insight Genesis™ custom mapping, C-MAP Insight PRO, C-MAP Lake Insight HD, C-MAP MAX-N+, Navionics® and more. HDS Carbon 16 supports radar, SmartSteer™ control of Motorguide® Xi5 trolling motors and the Lowrance Outboard Pilot, and full engine data integration highlighted by compatibility with Mercury® VesselView® Link. HDS Carbon 16 will be available in May, 2017. For more information on HDS Carbon displays, the HDS product family or the entire Lowrance line of marine electronics visit www.lowrance.com.